The lip contour area is particularly delicate and dry for being unprovided of sebaceous glands. With the course of time, in this zone appears expression wrinkles due to repetitive oral movements. Stem Cells NanoFiller Lip Contour is the first filling cream, based in vegetal mother-cells and hyaluronic acid, specifically developed for the treatment of the sensitive area of the lip contour. This unique combination acts synergistically and allows a dual effect: Restructure and Fill. Hyaluronic acid fills the thinner areas, providing support to the created cells. Over time, skin cells will lose the ability to perform its functions properly. From the the age of 30, the natural process of cell renewal slows down. The synthesis of fixation proteins, collagen and elastin decreases, producing a lower cutaneous cohesion which leads to the appearance of the first wrinkles and sagging. The skin becomes thinner, loses density, lightness and tone and expression lines and spots appear. 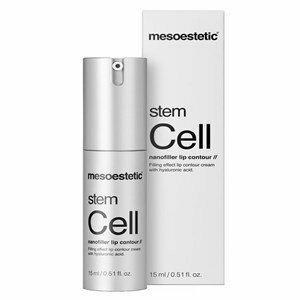 The Stem Cell Line from Mesoestetic intends to slow down the aging process through self-regeneration cell. To achieve this objective, it appealed to the use of mother cells vegetables. Apply by morning and at night on lip contour. The 4 degrees of aging skin may be treated differently through protocols both preventive and corrective.